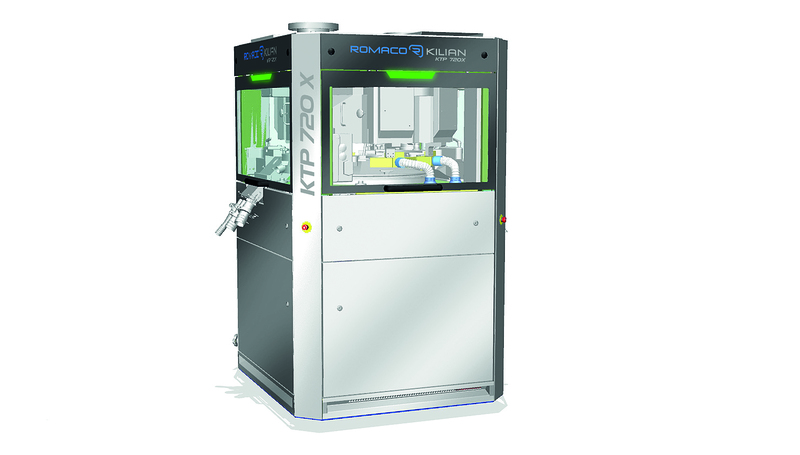 The new, ultra-high speed KTP 720X double-sided rotary press from Romaco Kilian will be unveiled at this year’s P-MEC. The engineering specialist will take the opportunity to underline its comprehensive expertise in pharmaceutical manufacturing and packing with Kilian, Noack, Macofar and Promatic technologies. One of the main highlights of the Romaco Group exhibit will be the new Romaco Kilian KTP 720X tablet press, which will be unveiled to interested trade visitors at the upcoming show. Representing the new generation of double-sided rotary presses, this machine is designed for manufacturing mono and bi-layer tablets for the pharmaceutical industry and impresses with very high availability. It compresses up to 1,020,000 tablets an hour absolutely reliably and is also suitable for processing poorly flowing materials. The brushless torque motor, extremely durable compression rollers and wear-free lower punch brakes with patented magnets result in very low total cost of ownership (TCO). The punch bellows protect the tablets from lubricants. Thanks to the hermetic separation of the compaction area and the machine compartment, the drives are never contaminated with product. The optimised hygienic design permits quick and easy cleaning. The new, Windows 7 based HMI panel with swipe functionality moreover simplifies operation considerably. As an option, the Romaco Kilian KTP 720X high speed tablet press can be supplied in combination with the new, integrated CWC (Continuous Weight Control) system. During the production process the CWC in-line scale measures the weight of the tablets continuously and adjusts the tablet press according to the weight data. There is no need for manual sampling and samples no longer have to be disposed of by the customer.